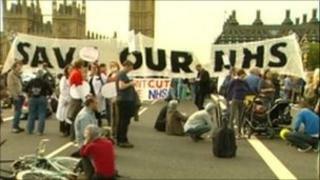 Demonstrators have blocked Westminster Bridge in central London in protest over proposed changes to the NHS. The UK Uncut protest came ahead of a Health and Social Care Bill debate in the House of Lords on Tuesday. Those at the demo want Tory peers to reject it. The BBC's Ben Ando said about 2,000 activists and health workers took part in Block the Bridge, Block the Bill. Organisers said over 3,000 attended. The bridge was closed to traffic for the event, which ended about 16:30 BST. The bridge, normally one of London's busiest, links St Thomas's hospital on the southern bank with the Houses of Parliament. Protesters dressed as medics unfurled a banner saying "Save our NHS" as part of Sunday's sit-down protest. Our correspondent said large numbers were NHS workers, and many wore hospital scrubs. Others wore bandages with fake blood. He said disruption had been "minimal" and numbers at the protest were lower than expected. Mark Arnold, a UK Uncut spokesman, said the protest had been effective and there was a "happy, party atmosphere" among the health workers, doctors and trade union members who participated. The Met Police said the main demonstration passed off peacefully but tweeted that a group of individuals not associated with UK Uncut had headed towards Lambeth Bridge at about 18:00 BST. The 64 individuals were contained on the bridge to enable officers to ask them to "remove disguises" they were wearing, a spokesman said. They were released an hour later. Prior to the demonstration, UK Uncut said: "If we want to save our NHS we need to shout as loud as we can. "No-one voted for this bill, but together we can stop it." And Mark Serwotka, general secretary of the Public and Commercial Services union, said: "The government's Health and Social Care Bill represents the gravest threat to the NHS, one of our nation's finest achievements, since its foundation." He said he hoped the protest would "send an important message of support to the brilliant doctors, nurses and other healthcare workers who work day in, day out to make our health service the envy of the world, and an equally important message of opposition to a Tory-led Government trying to unpick all of this". The government said the reforms in the bill had been consulted on and would give patients and doctors more choice, while encouraging the NHS to focus on results.